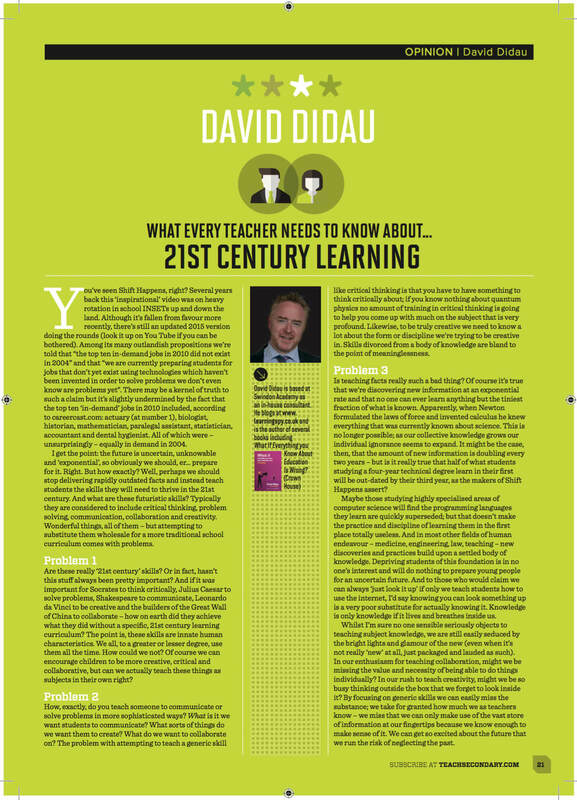 Here’s my column in this month’s Teach Secondary magazine which is packed full of stuff much better than my meagre scrawlings so you’d be well advised to subscribe. You’ve seen Shift Happens, right? Several years back this ‘inspirational’ video was on heavy rotation in school INSETs up and down the land. Although it’s fallen from favour more recently, there’s still an updated 2015 version doing the rounds (look it up on You Tube if you can be bothered). Among its many outlandish propositions we’re told that “the top ten in-demand jobs in 2010 did not exist in 2004” and that “we are currently preparing students for jobs that don’t yet exist using technologies which haven’t been invented in order to solve problems we don’t even know are problems yet”. There may be a kernel of truth to such a claim but it’s slightly undermined by the fact that the top ten ‘in-demand’ jobs in 2010 included, according to careercast.com: actuary (at number 1), biologist, historian, mathematician, paralegal assistant, statistician, accountant and dental hygienist. All of which were – unsurprisingly – equally in demand in 2004. I get the point: the future is uncertain, unknowable and ‘exponential’, so obviously we should, er… prepare for it. Right. But how exactly? Well, perhaps we should stop delivering rapidly outdated facts and instead teach students the skills they will need to thrive in the 21st century. And what are these futuristic skills? Typically they are considered to include critical thinking, problem-solving, communication, collaboration and creativity. Wonderful things, all of them – but attempting to substitute them wholesale for a more traditional school curriculum comes with problems. Are these really ‘21st-century’ skills? Or in fact, hasn’t this stuff always been pretty important? And if it was important for Socrates to think critically, Julius Caesar to solve problems, Shakespeare to communicate, Leonardo da Vinci to be creative and the builders of the Great Wall of China to collaborate – how on earth did they achieve what they did without a specific, 21st century learning curriculum? The point is, these skills are innate human characteristics. We all, to a greater or lesser degree, use them all the time. How could we not? Of course, we can encourage children to be more creative, critical and collaborative, but can we actually teach these things as subjects in their own right? How, exactly, do you teach someone to communicate or solve problems in more sophisticated ways? What is it we want students to communicate? What sorts of things do we want them to create? What do we want to collaborate on? The problem with attempting to teach a generic skill like critical thinking is that you must have something to think critically about; if you know nothing about quantum physics no amount of training in critical thinking is going to help you come up with much on the subject that is very profound. Likewise, to be truly creative we need to know a lot about the form or discipline we’re trying to be creative in. Skills divorced from a body of knowledge are bland to the point of meaninglessness. Is teaching facts really such a bad thing? Of course it’s true that we’re discovering new information at an exponential rate and that no one can ever learn anything but the tiniest fraction of what is known. Apparently, when Newton formulated the laws of force and invented calculus he knew everything that was currently known about science. This is no longer possible; as our collective knowledge grows our individual ignorance seems to expand. It might be the case, then, that the amount of new information is doubling every two years – but is it really true that half of what students studying a four-year technical degree learn in their first will be out-dated by their third year, as the makers of Shift Happens assert? Maybe those studying highly specialised areas of computer science will find the programming languages they learn are quickly superseded, but that doesn’t make the practice and discipline of learning them in the first place totally useless. And in most other fields of human endeavour – medicine, engineering, law, teaching – new discoveries and practices build upon a settled body of knowledge. Depriving students of this foundation is in no one’s interest and will do nothing to prepare young people for an uncertain future. And to those who would claim we can always ‘just look it up’ if only we teach students how to use the internet, I’d say knowing you can look something up is a very poor substitute for actually knowing it. Knowledge is only knowledge if it lives and breathes inside us. not really ‘new’ at all, just packaged and lauded as such). In our enthusiasm for teaching collaboration, might we be missing the value and necessity of being able to do things individually? In our rush to teach creativity, might we be so busy thinking outside the box that we forget to look inside it? By focusing on generic skills we can easily miss the substance; we take for granted how much we as teachers know – we miss that we can only make use of the vast store of information at our fingertips because we know enough to make sense of it. We can get so excited about the future that we run the risk of neglecting the past. Unreserved agreement. I particularly liked is bit: “Knowledge is only knowledge if it lives and breathes inside us.” In line with recent my recent thinking on mental models, active learning and such. Your child’s mental model doesn’t exist on the Internet. The mental model doesn’ exist in their calculator. The mental model exists in their mind, and if there isn’t any knowledge in their mind, their mental model has nothing to be built out of. If there is little knowledge already in a person’s head, it is much hard to locate hooks onto which the new knowledge can be hung. And building new knowledge into our existing mental scheme is pretty much the sum and total of learning. If one looks at interventions held for children – what is the focus of the majority of them? Knowledge! Why is that? Why aren’t children falling behind as a result of lack of critical thinking skills or creativity? Convincingly argued, David. Do you think it necessary for the ‘knowledge’ to be specified or is that just useful because of testing? If anyone is opposed to “rapidly out of date skills” then they ought to oppose the unconstrained introduction and reliance on technology in the classroom. For, if there is anything one can say about the staying power of such skills it is this: there is hardly a skill you can name that will not go out of date faster than the skill of being able to use this year’s electronics toys. But if the IT allows a clearer understanding of how a river forms or how a plant is pollinated or how a heart works is it not a tool to further enhance knowledge, rather than a ‘this year’s fad’? Reminds me of Daisy Christodoulou. That’s a good thing. I feel this misses the point, just like the original argument it opposes. I’m only talking from UK experience here, but I would love to see a classroom in a state school that doesn’t aim to impart “a body of knowledge”. If anything, the entire National Curriculum (but more specifically, each exam specification) is exactly that, a body of knowledge we expect children to know. We follow it to differing degrees but nonetheless we’re working towards a fixed body of knowledge. But to access the body, and to encourage a lifelong desire to improve understanding, critical thinking skills are essential. The kids who memorise all the facts but couldn’t string them together to show any kind of meaningful understanding will still do pretty well in our system. These are the same students employers complain about when it comes round to the world of work. The kids who learn a reasonable portion of the facts but who also have the confidence to formulate a “bigger picture” of what they’re discussing will succeed- both academically and in other areas of life. Key point: Yes facts are necessary. Yes critical thinking is necessary. Even Better If: The phrase “Knowledge is only knowledge if it lives and breathes inside us” is consigned to the ‘bland to the point of meaningless’ bin. I went through about 18 months where I saw that cringeworthy ‘shift happens’ video about 6/7 different times at various training events and INSETs. Each one delivered by a lazy presenter who believed in their own over-inflated hype. Farcical.